After a 9 week operation to catch Jessie she was finally caught yesterday as the sun rose in Port Soif. The poor beagle had been rescued in April from a UK rehoming centre and managed to escape as she had pulled a flexi lead out of the owners hands which spooked her when it hit the floor and she took off. 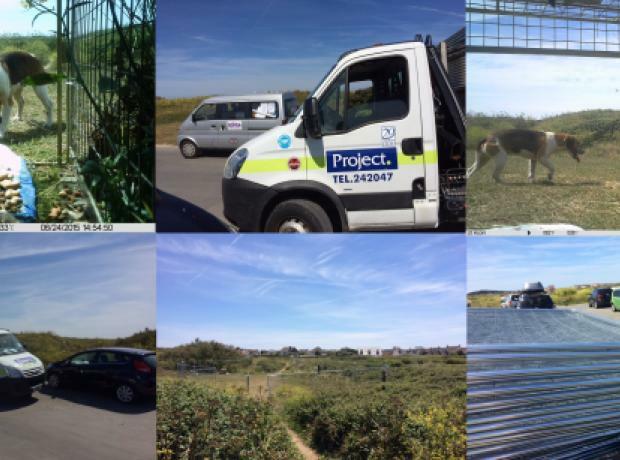 Since late April the GSPCA have been working with the owners to rescue Jessie and the team at the Animal Shelter were overjoyed yesterday when after a huge operation they were able to catch her thanks to a massive effort and a kind member of public helping. Today after 9 weeks of searching we are delighted to report that we have caught Jessie the stray beagle at our giant man made dog trap. Just after 5.30am a dog walker passing by the GSPCA man made dog trap that was designed by Steve Byrne GSPCA Manager, equipped by Project and Access Scaffolding, placed and erected by the GSPCA team and finished off by a team from States Works saw Jessie enter through the only entrance. Over the last few days Jessie has been growing in confidence in and around our new trap although quite wary. 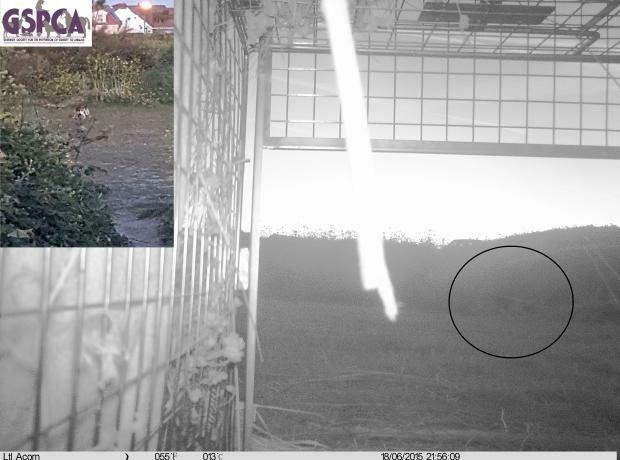 The plan soon will be to close off a number of the entry points so that a GSPCA team can camp out to trap her inside. A new plan has been launched today to catch Jessie the stray beagle, but we are having dozens or reports of people trying to chase or follow her which is extremely unhelpful. Again we had over a dozen sightings yesterday by phone and messaged through to us at the GSPCA and we appreciate all of the continued support. The new escalated capture of Jessie has been launched after the kind temporary permissions from the States to fence an area off around the trap. Yesterday we were very worried that Jessie may have left the west coast of Guernsey, but we are pleased to report she appears to remain in the area. We had over a dozen sightings yesterday by phone and messaged through to us at the GSPCA and we appreciate all of the continued support. We are currently escalating the capture of Jessie and just received temporary permissions from the States to fence an area off around the trap to help with her capture. First thing this morning we are aware that Jessie the stray beagle was around the west coast and feeding next to our dog trap. We have just received a report that may indicate that she is back in St Andrews, but we are appealing if you do see her to please call 257261. We are aware that Jessie has been chased by members of public trying to catch her which we are asking people not to do as this will scare her from the area she is happy in and may have resulted in her moving inland. Jessie continues to remain along the west coast and we are very thankful for all of the reports. Her confidence is building once again around the trap and we are hoping that she will continue to do so. We would like to highlight she is very timid and nervous and please DO NOT chase or follow her as it is likely to scare her from the area she is happy in. We are pleased to report that despite Jessie being let out of the trap on Wednesday morning she has remained along the west coast with reports, sightings and GSPCA team members tracking her up until late last night. As at 11am we have had two reports confirming her location very near the trap, and GSPCA team members monitored her last night feeding next to it although extremely wary and unsure. 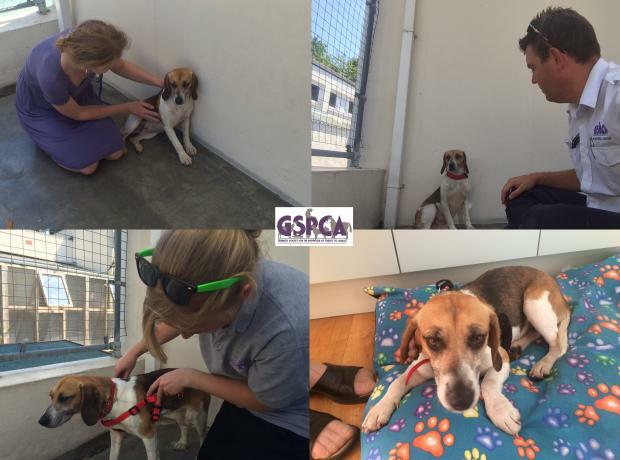 During the early hours of this morning Jessie the stray beagle cross took the bait and was caught in the GSPCA dog trap along the west coast of Guernsey. The team at the GSPCA have been working since the 28th April to capture and reunite this very nervous rescue dog with her owners. We continue to monitor Jessie the stray beagle cross who is becoming more confident around our trap although still extremely nervous of people. GSPCA staff and volunteers continue to monitor her movements, feeding and drinking habits and hope to soon be close to catching her for her owners. Even today we are aware of where she is and team members have been monitoring her. We are aware that yesterday she moved inland around the Oatlands area, but she is now back on the west coast.